I visited Iran for the first time in May 2017. What an amazing experience and the country lived up to all the hype I had heard, I can honestly say its one of the very best trip I have ever done. The purpose of the journey was to join up with my son who is driving from London to Beijing with 2 other friends. The country is vast with ever topography, has a wealth of history and culture to see and the Iranians we met were just so friendly. The common western belief is that its full of fanatical religious zealots, but the reality is very different. 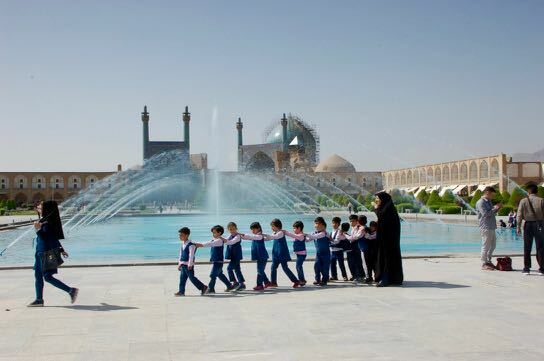 Whilst clearly is still run by a religious elite who most people seem to have little time for, the country is open to tourists, travelling is easy and Iran still retains a secular feel to it despite the daily signs of adherence to some quite strict Islamic dress and behaviour codes. All westerners need a visa but the process is clear and straightforward, for British, US and Canadian citizens it's a little more difficult, one has be escorted by a tour guide whilst in Iran and its worth noting that the US and Canada still has no diplomatic representation in Iran. The British embassy reopened in 2016, but being British is not a problem, everyone we met were delighted to see us, they wanted to practice their English and we met no hostility from any quarter. To get a visa one needs to get a pre authorization code from an Iranian travel agent. We used Iranian Tours, www.iraniantours.com who were quite excellent, I highly recommend them. They also do a visa service, www.iranianvisa.com. It might take up to 4 weeks to get the code but once you have it you can get a visa very quickly. The Iran consulate in London even offers a same day service for around £120. Women should wear headscarves when getting their visa from the consulate. For those taking cars into Iran you must have a Carnet de Passage, it's the only country in Central Asia that you should need one. You might be able to get it on the border but we would advise getting it in advance. For Brits this can be got from Cars Europe, www.carseurope.net. For Germans you can get it from ADAC based in Munich. You will need to buy third party car insurance (the car is insured not the drivers). My son’s cost € 60, it should have been €80 but the official was also a Chelsea fan the power of the Premier League! Whilst on the subject of driving, petrol is cheap, 20p/L with 3 octane levels available. The roads are good but the standard of driving is very poor but we were assured it had improved and the police now rigorously enforce the speed limit on the motorways. The latter also have tolls, its not expensive. I mentioned that for a tourist Iran is not as repressive country as some preconceived ideas, however you have to dress appropriately. For men absolutely no shorts, Women (and girls over 9) will have to wear a headscarf at all times, you will see in the more western areas the women wear their headscarf’s as far back on their heads as possible. But headscarves should be worn at all times in public. Accessing mosques was not a problem but as a non-Muslim we could not get into the central part of some of the holy shrines. Iran is unlike most other Muslim countries, the women readily shake hands and we had a constant stream of girls and women wanting to be photographed with us, I suspect more out of curiosity rather than our good looks. Naturally we tried to stay off politics but it was the elections approaching scores of people we met expressed delight at us being in Iran but were not exactly complimentary about their government. Rather left of field, the thumbs up sign as the opposite meaning in Iran although most Iranians (due to the social media ‘like’ symbol) understand its meant with good intention. Leave your Visa and Mastercard behind! Due to the sanctions imposed by the 5 + 1 countries & in particular these card companies being American, they can’t be used, you must have cash. As for which currencies either US Dollars or Euros probably best but Pounds Sterling are readily changeable, you can change in registered exchange offices, hotels or often on the street. You need to have a very good understanding of the exchange rate and be firm if changing on the street, often they quote a rate & amount but then try to give you slightly less due to their commission. A rate and amount agreed is the deal, walk away if they try to play the commission card. The currency, the Iranian Rial (IRR), is a closed currency so you are not be able to buy in advance. What is confusing is that prices are often express in either Rials or Toman. One Toman is 10 Rials, so a course in a restaurant might be listed as 34,000 Rial but the waiter might quote 3,400 Toman. Tomans are occasions called Khomeini as the Ayatollah was on the bank note. Iran is relatively cheap; a good meal might be £8 or £10 per head. There are hotels of all standards and the standard is good, all good hotels will have internet although some are restricted to the reception area. Speeds vary, we were told that the government had increased speeds as the election was approaching. The BBC & CNN are blocked but not the Guardian or Times, as one would expect, the Government tries to control access but its clear that most Iranian use VPNs to get around the restrictions. Satellite dishes are also banned in theory but again most locals have them and it seems the government is losing the control battle. We couldn’t download new books onto a Kindle, I imagine that due to sanctions Amazon has blocked any Iranian IP addresses, so do all your downloading before you pack your bags! Apart from hotels wanting to retain your passports, we experienced no other official controls. It should be remembered that Iran is in a major earthquake zone and Iranians often express concern. The main focus of worry is Tehran, which I understand, is built on 2 fault lines and should there be a severe quake casualties are expected in the 100s of thousands due to poor building codes (or their enforcement), if you are concerned try to stay in a more modern hotel and make sure your party understand the threat and some actions that might improve survival chances. There is so much, my advice is try to see more than just the well know sites such as Shiraz, Esfahan, Mashhad and Persepolis, these are all amazing but so are the mosques and bazaars in Tabriz and Zanjan and the countryside around Takht-e-Soleiman (and the volcano plug) in the north west for example. Do take a paper map with you so you can plan routes off the motorways and through the mountains. The road from Esfahan to Shiraz via Vasuj is truly spectacular. So much of the charm of Iran is pottering in the bazaars and one doesn’t get hassled in the same way as one might in Turkey or India. Tehran is large and polluted, using the metro is a good way of getting about. The Holy war (Iran - Iraq war) museum is quite excellent as I understand is the Jewelry museum. If you want to get away from the smog go to the northern end of the red metro line and visit the bazaar and restaurants in the Darband area, and skiing? Yes, between December and April the resorts of Dizin and Shemshak near Tehran, also near Tabriz and Zagros mountains in the Shiraz area. If you can allow yourself 2 weeks in order to see a decent chunk of this extraordinary country.